The Victorian government announced that it would be introducing a time-varying solar feed-in tariff (TV FiT) earlier this year, and the tariff came into effect on the first of July. Now that the time-varying feed-in tariff is available as an alternative to the standard flat rate feed-in tariff, should you opt for your own solar household? Relatedly, does the new TV FiT significantly improve the financial case for going solar in Victoria? We break it down in this article and attempt to answer these questions – and we’ve put together a free-to-use calculator tool to help you answer your own! What is Victoria’s time-varying feed-in tariff? A solar feed-in tariff is the rate that you are credited for solar energy that you send/export into the electricity grid; in practice, this is any electricity that you don’t manage to use directly in your home (i.e. solar self-consumption). Since rooftop solar started becoming popular about a decade ago, solar feed-in tariffs have been a central way that households have obtained value from owning a solar system. Until recently, all feed-in tariffs were offered as a ‘flat rate’ – for example, 11c per kilowatt-hour (kWh) for your excess solar energy, no matter when you export it to the grid (whether that be morning, midday or afternoon). Victoria was the first Australian state to announce that they would be introducing an alternative to this approach, with rates that reflect the fact that the value of solar energy on the grid is actually different depending on the time of day. Solar is worth the most during afternoon ‘peak’ periods, when lots of households and businesses are using electricity; it is worth the least during ‘off peak’ periods when fewer people are using electricity. How much does the TV FiT pay? Victoria is currently the only state that has a government-mandated minimum feed-in tariff rate (a stark difference from Queensland, NSW and South Australia, where there is no official minimum). Last year, there was only a flat rate tariff, and that was mandated to be 11.3c/kWh. This year, with the introduction of the TV FiT, there are now two programs with a mandatory minimum. The flat rate is still in place, but has been decreased slightly. The Victorian Essential Services Commission (ESC), which sets the mandatory minimum every year, have put the flat rate at 10c/kWh. For the time-varying tariff, the rates are 7c/kWh for off-peak (mostly overnight), 10c/kWh for shoulder and 29c/kWh for peak. Victoria’s time-varying feed-in tariff schedule, as per the ESC. A 29c/kWh feed-in tariff – the TV FiT peak rate – sounds absolutely fantastic, especially after years of feed-in tariffs hovering around the 8-12c/kWh mark. But the reality is that the TV FiT’s ‘peak’ period begins just as solar PV systems are just past the peak of their production for the day. This means your system is likely to be producing less energy during peak times, instead producing most of the energy during ‘shoulder’ times – currently set at 10c/kWh. This is roughly the same as the flat rate set by the ESC (more on this later). What’s interesting about the TV FiT is it brings up the question of whether it’s worth opting for west-facing panels to take advantage of the higher rate in the afternoon. If a solar panel array faces west, it will generally produce less electricity overall (compared to a north-facing system) but more in the late afternoon, when it’s arguably more useful. The animation below provides an at-a-glance view of how much solar production is likely to overlap with the ‘peak’ solar feed-in time. As you can see, more of the solar production occurs during the TV FiT peak period with a west-facing roof than with east or north-facing. Which one is better for you: Flat FiT or TV FiT? And then comes the crucial question: If you have solar, which should you choose? The answer should be pretty clear that the TV FiT is the better option. To start with, the flat rate is only 9.9c/kWh, while the shoulder rate on the TV FiT – which spans most of the sunniest hours of the day – is 10.3c/kWh. 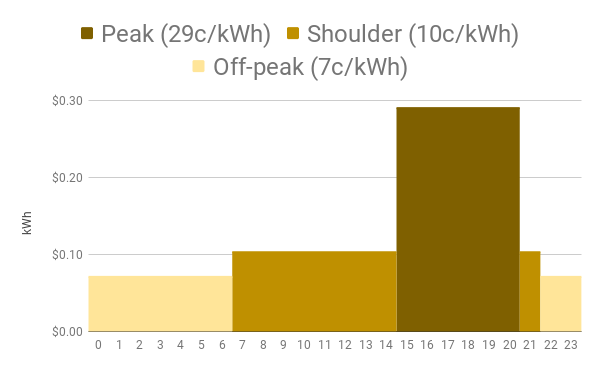 The off-peak TV FiT rate only applies between 10pm and 7am – during which time solar panels are generally not producing much electricity (especially in the winter), while the 29c/kWh peak rate has a modest (though not sizeable) overlap with solar production times throughout the year. But just in case, let’s have a look at how much more money a solar home could save (in the form of feed-in credits) on the TV FiT. The table below displays the estimated value of the flat feed-in tariff vs the TV FiT for a Melbourne home with a 5kW solar system using 25kWh of energy per day (on the ‘evening peak’ pattern). It looks at five of the most common orientations for panels: North, west, northwest, northeast and east. Please note that the figures in the table below are indicative only. We encourage you to look at the numbers for your own situation where possible. So does the TV FiT make solar a better investment? While Victoria’s time-variable feed-in tariff does not completely change the economics of going solar, it is absolutely a good things for the state’s tens of thousands of solar homes (and would-be solar homes). The only circumstances where it makes sense for someone to choose the flat rate over the TV FiT is where their panels face in an easterly direction; for north-facing and westerly-facing roofs, the TV FiT holds the clear advantage. That being said, as the additional savings associated directly with the TV FiT are likely to be relatively minor, it does not fundamentally change the investment case for going solar in Victoria. It could, however, help to change the economics of battery storage in the years going forward, as technologies that support ‘selective energy export‘ become more common. In fact, this seems to be the sort of thing that Victoria’s ESC has intentionally set the stage for by introducing the TV FiT. We’ve created a modified version of our Solar Payback Estimator Tool specifically to help customers work out whether Victoria’s TV FiT is right for them. You can access it below. Since 2008, we’ve assisted over 130,000 Australian homes & businesses in making an informed choice about going solar.